Jeanne had always liked Innocent. She would run into him heading to the river to fish as she was on her way to weed her green bean patch. In the evening, Innocent would give Jeanne's husband Nicholas a few extra fish that he'd caught that day, and then they'd share a few glasses of urwagwa, the local beer made from banana juice and roasted sorghum. Jeanne was always grateful for Innocent. She had 11 children, and the fish helped fill the dinner table. Then in 1990, ethnic tensions that had been smoldering for years ignited. This coincided with the Rwandan Patriotic Front — made up of Tutsis, just Iike Jeanne and Nicholas — invading the country for three years, clashing with Hutu govemment forces as well as French and Zairian troops sent in as reinforcements. Jeanne saw Hutus entering and leaving buildings, never sure what they were talking about. The more they met, the more she worried. Nicholas was sure the stares and whispers against Tutsis were sorne kind of a bad joke. Then the threats started. Jeanne says she remembers the neighbors saying: "The time will come when we will kill all of you. From children to unbom babies, to the elderly, we don't want any of you left behind. You will all perish." Jeanne had to pull her kids out of school because their classmates beat them up as they walked to school in the morning. "You Tutsis are useless!" the children would yell at them. Her children would come home and ask, "Why do people say that to us, Mom?" Jeanne would look at them and not know how to respond. "Because we're Tutsis," she'd tell them. The truth was, Jeanne sometimes asked herself the same question. So they waited. Their Hutu neighbors didn't talk to them anymore, including Innocent, a Hutu. He was never much for politics, but was swept up in the fury. The tension in villages and towns around Rwanda smoldered. And then, on June 6, 1994, the plane carrying Rwandan president Juvénal Habyarimana was shot down. Habyarimana was a Hutu. Rwanda exploded; the killing started almost immediately. "The most difficult part," says Jeanne, "was that you couldn't hide anywhere. These were people that knew our moves, we had nowhere to run." The neighbors started by toying with them, a dark kind of harassment. "Everyone outside," a neighbor barked at Jeanne, Nicholas and the kids. "Make a straight line." "Why are you doing this?" Jeanne cried out. "We're friends." "We can't be friends with the Tutsis, with snakes like you," they responded. "Start praying," they said, "because you're all going to die." Snakes are all the same, Jeanne remembers them saying, referring to Tutsis. If you kili a big snake (an adult) and you leave the small one (a child), it will grow up and bite you. But that night, they hadn't come to kill, just to terrify. They walked off into the night, leaving Jeanne and the kids trembling and confused. "I wondered," she says, "how people could change in such a short time. How could someone turn against you who has been your friend — who you've Iived with in the same neighborhood without any problem, your kids visiting each other — and all of a sudden they start calling you names and killing you." By this time, Kigali was hemorrhaging with violence. Often drunk on banana beer, Hutus manned roadblocks and sharpened their machetes on the asphalt roads. They Iistened to Radio Mille Collines as their broadcasts poured gasoline on the tire of hatred. "In truth, all Tutsis will perish," the announcers said. "They are disappearing little by little thanks to the weapons hitting them .... They are being killed Iike rats." Nicholas wondered if their neighbors really had it in them to kill their good friends. Could Innocent, his drinking buddy, really take a machete to him? Jeanne knew he could. So she gathered up the kids, all except her two grown boys who thought they'd be fine at home, and fled to the woods. Not long after, Innocent showed up at the family house with a cutlass. Jeanne doesn't know exactly what happened; friends later recounted what they saw. She says her two oldest boys—who were funny and warm and bought pens and notebooks for their younger siblings, who had known lnnocent most of their lives—hid, but he found them. He killed them. Then walked home and told his wife Dorcella what he'd done. "He was different, kind of scared," says Dorcella. "Like someone who has done something for the first time. He wondered what would happen later. And he was haunted by the fact he had killed friends that he knew." The next night, Nicholas, perhaps thinking he'd lose his job as a security guard if he didn't show up, went to work. Perhaps he didn't realize roadblocks had been set up or just how deep the hatred was against Tutsis. Nicholas never made it home from work. Someone told Jeanne they saw his body in the street; they described how he'd been killed by machetes. 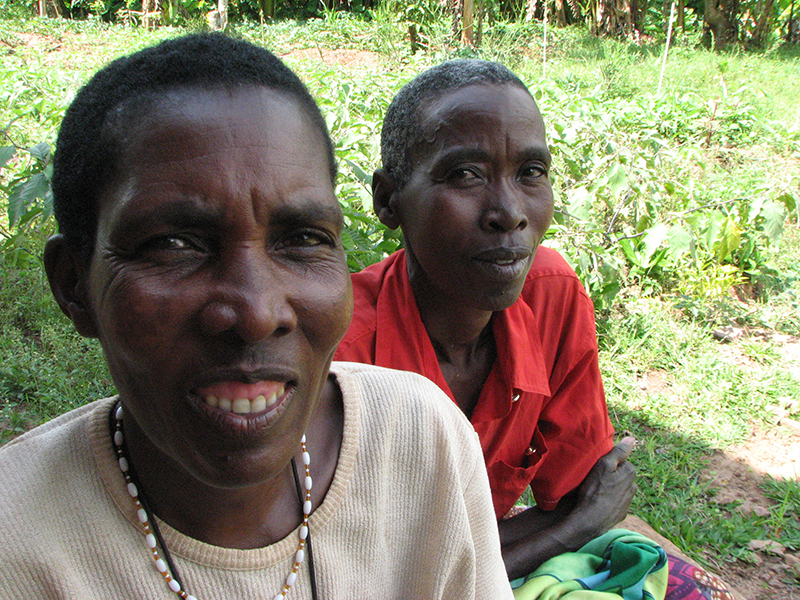 The Interahamwe—the Hutu militia — eventually found Jeanne and the kids in the forest. They marched them and other Tutsis away to be killed. But they ran into a contingent of Rwandan Patriotic Front soldiers. The Hutus fled. Jeanne and the kids were saved. After the genocide, Innocent and Dorcella escaped to Democratic Republic of the Congo. But Jeanne was trapped by the images of her family. She couldn't turn off the film that was playing in her mind: of her boys, of her husband. lt played in a loop, their lives, their deaths. She had to get it out of her system. She unleashed her story on everyone she met; she shouted at them, about how her men had been killed. "The thing that hurt me the most," Jeanne says, "was that I didn't get a chance to bury my kids." "All that time I felt that pain in my heart and that hatred," she says. "And there were so many times I asked myself: Why did this happen to me? Why did these people do this?" "What kept me going was Dorcella," says Jeanne. "She told me the truth: 'You're my friend,' she said, 'I can't hide this from you. My husband [killed your boys].' "
Jeanne knew that, in a way, Dorcella had lost her husband, too. He wasn't the man she'd lived with for all those years; he had turned into someone else. Two years later, Innocent and Dorcella retumed to Rwanda, prepared to live with the consequences. Jeanne passed Innocent on the village footpath one day. "People say you killed my children," Jeanne told him. "Yes, that's true," he said. "l killed your family." Then he asked for forgiveness. Jeanne wasn't ready, but the urge was building. Within two weeks, he was arrested by the state. He served four years in jail. During this time, he converted to Islam. And he battled his own demons. Every time Dorcella visited him, he sent her away with two messages: Tell Jeanne I'm sorry. Ask her to forgive me. During this time, Jeanne started hearing the priest at her Catholic church talk about forgiveness and reconciliation. Since 1996, Catholic Relief Services and Caritas have been teaching priests in five Rwandan dioceses how to talk about reconciliation with their parishioners. They also work with volunteers who visit Rwandans who have gone through trauma and discuss the importance of forgiveness and conflict resolution. If I forgive him, Jeanne thought, maybe I can finally live in peace. While Innocent was serving his sentence, Jeanne knew it was time. She sat her kids down and told them that she was going to forgive Innocent. "I have forgiven him," Jeanne told her kids. "What about you?" The kids forgave him too. But it's different for them. They don't remember the genocide. And, unlike their mother, they haven't gone to visit Innocent in prison. They haven't spent time with him, chatting about life. Four years later, Innocent was a free man. He wanted to show Jeanne that he was genuinely sorry. 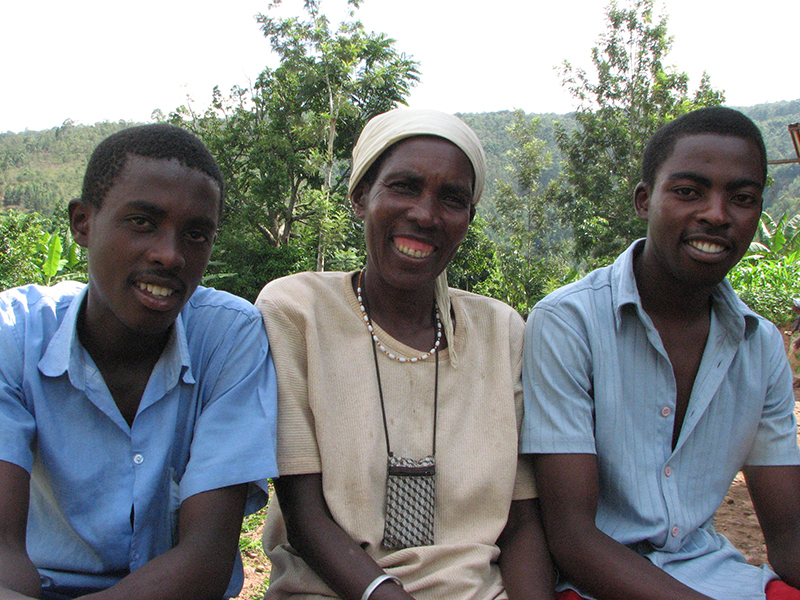 Innocent brought banana beer to Jeanne's house — a way of asking forgiveness in Rwanda. This time, Jeanne said yes. In 2005, Innocent appeared before a gacaca (GA-cha-cha) court, a Rwandan trial by peers based on community justice. During the hearing, Innocent described the panga, the traditional machete, and how he hit Jeanne's sons. The detail was graphic, but Jeanne never wavered. Her forgiveness of lnnocent remained. It was so deep, in fact, she told the authorities that she forgave Innocent, thinking her forgiveness would release him from prison. The authorities weren't swayed. The gacaca court sentenced him to 27 years in prison. lt's been a month since Jeanne's seen Innocent. He's converted back to Catholicism and even had an official wedding ceremony with Dorcella. Jeanne attended. Jeanne goes to the prison when she can, whenever she has money. She likes to take him bread and sugar to sweeten the bland porridge in prison. She says she's forgiven him unconditionally. That it's set her free. The days of her thoughts being consumed by Nicholas and the boys are fewer now. They don't even talk about the past now. The conversation is comfortable, like two old friends. They talk about common friends in the village. She asks how he's doing. And he asks about her kids. Lane Hartill is the former western and central Africa regional information officer for Catholic Relief Services.